I can’t believe we haven’t talked about berry cobbler yet. August 27, and we haven’t talked about berry cobbler. I’ve got to fix that. For a long time, I didn’t get terribly excited about cobbler. I think you’re either a cobbler person or a crisp person, the same way that you’re either a cake person or a pie person. My mother is a crisp person, and that’s what I grew up eating. I can be swayed by crumbles as well, mostly because they’re often indistinguishable from crisps, and also because crumble is such a nice word for a dessert. It sounds exactly like it tastes. (On a side note: did you know that French speakers pronounce it crum-bell? It’s awesome. I’m pretty sure Crum Bell is related to Tinker Bell, only she dresses a lot frumpier.) But more generally, in the matter of cobbler versus crisp, I lean consistently in the direction of crisp. It’s hard to beat anything involving streusel. I met my friend Hannah a few years ago, and one day not long after, one completely normal day that was not even remotely near my birthday or any other holiday or special occasion, she gave me a copy of Chez Panisse Desserts. It was a first-edition copy, no less, a hardcover with the original Wayne Thiebaud jacket! I still feel a little faint when I think about it. Hannah didn’t know this at the time, but I had learned about Wayne Thiebaud in high school, and I loved his work so much that I bought a Wayne Thiebaud calendar and a Wayne Thiebaud day planner and spent most of a semester attempting to imitate him, outlining the objects in my paintings with thick, brightly colored strokes, and as a result, making a lot of regrettable artwork that now resides in a landfill somewhere. I loved Wayne Thiebaud. I loved this cookbook. It had been her grandmother’s, Hannah told me. When Hannah was a kid, she used to spend weekends at her grandmother’s house. Sometimes she would try on her grandmother’s jewelry, and sometimes they would sit on the couch together, Hannah’s head on her grandmother’s lap, watching Julia Child, or Doctor Who, or golf. Hannah tells me that her grandmother would scratch her back as long as she wanted without ever complaining, which, as everybody knows, is the universal sign of a first-rate person. Sometimes the two of them would cook together. Hannah’s grandmother would stand her up at the kitchen counter on an upturned two-gallon bucket and let her help to measure, pour, and stir. Her grandmother had a huge collection of cookbooks, and I think Hannah would like me to put special emphasis on the adjective huge. It was huuuuuge. 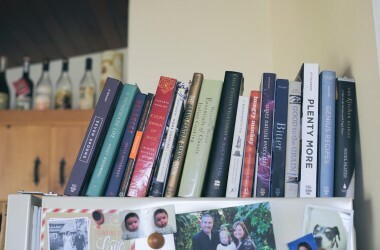 A few years ago, her grandmother began getting rid of some of her possessions, making her life a little smaller, and she told Hannah that she should take some of the cookbooks. Hannah went through the titles and, naturally, took home a stack of Julia Child books. 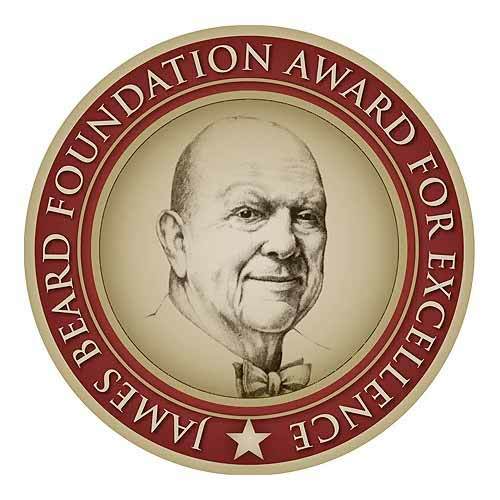 She also spotted Chez Panisse Desserts, and she thought I might be able to do some good with it. So she took it home, and then she gave it to me. I keep it on the shelf next to the stove, and whenever I see it, I think of Hannah’s grandmother. I will probably never meet her, but I like to think that we know each other now somehow, that we’re connected in some small way. I wonder if she is a cobbler person or a crisp person. A couple of weeks ago, I had a surplus of berries lying around and felt like baking. I pulled out Chez Panisse Desserts. I opened it up to the berry chapter, and the first recipe was for a simple cobbler. I guess I could have kept looking, poking around for a crisp or a cake or something else, but this cobbler sounded right. It sounded honest, not at all flashy, just a biscuit-like dough enriched with butter and cream, baked over sugared berries. There were no unusual flavorings or spices or flours or grains. I liked that. I liked that it was confident in its simplicity. So I tried it. I know there are a million recipes out there for cobbler, and that what the world probably wants is some kind of new and different spin on the concept, but that’s not what this recipe is about. It doesn’t reinvent anything, and it’s not going to tie your shoes for you. That’s not what it’s meant to do. It’s meant to be an excellent cobbler, and it is. The topping is both light and rich, the way a good biscuit should be, and the fruit is only gently sweetened, its juices barely bound up with a spoonful of flour. It gets everything right. You could serve it warm with a splash of cold cream, or you could eat it warm with nothing, and the next day, you can stand at the counter and eat it from the pan, the way I did. In return, it made a cobbler person of me. Lindsey Shere was Chez Panisse’s original pastry chef, and I love her style. She approaches even the simplest desserts with elegance and great precision. This cobbler is a good example of that. The original version of this recipe calls for boysenberries, blueberries, and raspberries. I make it with roughly 3 cups of blueberries and 1½ cups of raspberries, and I love the flavor that results. I think I’ll be sticking with that combination for a while, although I might be tempted to work in some blackberries. The only berries that don’t work so nicely here are strawberries. The texture gets weird: spongy and slimy, a little reminiscent of a jellyfish. Oh, and if you’re using frozen berries, I recommend thawing them at least partially, or else they take a little longer to cook. Toss the berries with the sugar and flour. Use the larger amount of flour if the berries are very juicy. Set aside. Put the berry mixture into a 1½-quart baking dish. Scoop up lumps of dough and form into rough patties, 2 to 2½ inches in diameter and about ½ inch thick. I find that the dough is a little sticky, so it helps to moisten my hands with a little water. Arrange the dough patties on top of the berries. Bake for 35 to 40 minutes, or until the topping is set and lightly browned and the berry juices bubble thickly around the edges of the dish. Serve warm, with cream to pour over. Note: This cobbler keeps well at room temperature for about two days. (I don’t like to refrigerate it, because the texture of the topping changes.) Rewarm it gently, if you want, before serving. yum – sounds delicious…and wish we lived a bit closer to come to Delancey for our anniversary – that dinner sounds divine! This recipe looks truly wonderful. I love the restrained amount of sugar used here — beautiful summer berries hardly need any help to shine! Of course Chez Panisse would get that right. Cobbler… I like the word but never eaten the dessert. I have to try it, soon! What a fantastic story!! 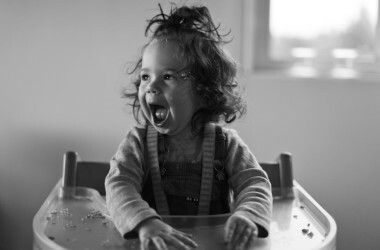 I always love hearing about your friend, Hannah, because it's like those songs that have cities in them and so when I hear about Hannah I feel connected like Oh, Yay – Kansas City!! Like me! even though she's not here anymore — KC! Also, what a fantastic recipe – perfect for using up some of the bountiful blackberries from my mom's house where she has a big, fat row of heavy blackberry bushes – a kind with no thorns which feels a little like cheating when we pick those berries. Love hearing about anyone with a huge cookbook collection…makes me feel…better…about mine 🙂 As though it is not alone! This looks lovely. Clearly I need to eat more cobblers and crisps because I don't think I know which one I lean towards! That berry cobbler looks fabulous! cobblers, crisps, grunts, betty's, buckles, slumps, pandowdy, clafouti…love them all!!! I agree the berries are the star of the show and should be kept simple, just a little contrasting crunch so that they dance well together. I like this recipe, thanks. I am fully confident in Crum Bell's crumble-making abilities. I love a good fairy, but can we really expect Tinker Bell to be good at desserts? (Look at the size of her.) Now, if only I could ring a bell and have this dessert made! 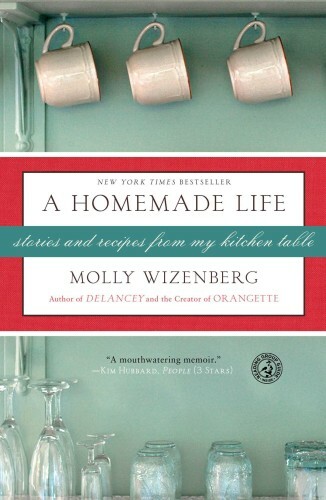 Thanks, Molly, for sharing your wealth of recipes on food … and life! you as well…you approach every word of every post with elegance and great precision. love your writings & recipes. wishing you & delancey all the best! I absolutely love that cookbook. The recipes are simple and elegant without being austere, just like the recipes in Alice Medrich's Pure Dessert. My favorite preserves are Queens Blend by Hafi. It is a combination of red raspberries (there are black raspberries) and wild blueberries, and they are delicious, so I know this is a wonderful combination. I keep threatening to use them in a linzertorte instead of just raspberry, but so far I haven't. There are still raspberries and blueberries at the farmstand upstate, and that book stands in a line of my most loved, so I will put it from the shelf and check it out – then follow your adaptation. We started listening to the Audible version of your book in the car on the way home from the country last Sunday, and it is great – I just wish you were reading it! Have fun at your family dinner. It sounds like great fun. 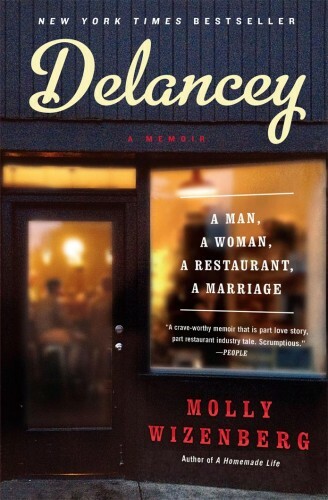 Oh, I cannot wait to finally visit Delancey someday. Hopefully this winter when we make a trek across the pond, we'll see if we might be able to snag a seat or two. LOVE the 'family dinner' idea! I am a total cobbler person, I do like apple crisp in Autumn though. I am ashamed to say that I have never had a “cobbler” but that may have to change ASAP! Looks delish!! and a slightly silly question: what is the difference between a fruit cobbler, a fruit pie and a fruit crumble? just the (consistency of the) dough? Lovely recipe…added to the dose of nostalgia about a back-scratching grandma…ours did that too. Thanks. I am so very glad that infinite, selfless back scratching has finally been called out as it should be. Things like flowers and chocolate get way too much press, turning their niceness into mundanity and ignoring other gifts universally accepted as marvelous. Like back scratching. I can't believe I haven't been berry picking yet this year. Peaches, yes. Corn, yes. Berries, no! I think that should provide me with an overabundance of raspberries — maybe even some blackberries — to make this cobbler. I like the word cobbler too. There's something so warm about it, like it just wants to break into joyous fireworks of berry delight across your tongue. I also think I need to take a trip up to Seattle and indulge in several of Delancey's pizzas. Soon, I keep telling myself. Your writing always makes me smile. And that recipe – well, it's a keeper. Who can find fault with a Chez Panisse dessert? I've been reading your blog for about two years, and I think this is the first time I've commented. But I just had to. I've been meaning to get your book since I first heard about it, but a friend recently saved me by getting it for me as a birthday gift. I finished it last night and I just wanted to let you know how much I loved it. I consumed it so quickly and was sad to reach the last page. What a marvelous book. I can't wait to try some of the recipes. Mmmm. This looks aMAZING, and I love that the crust is a little biscuit-y. 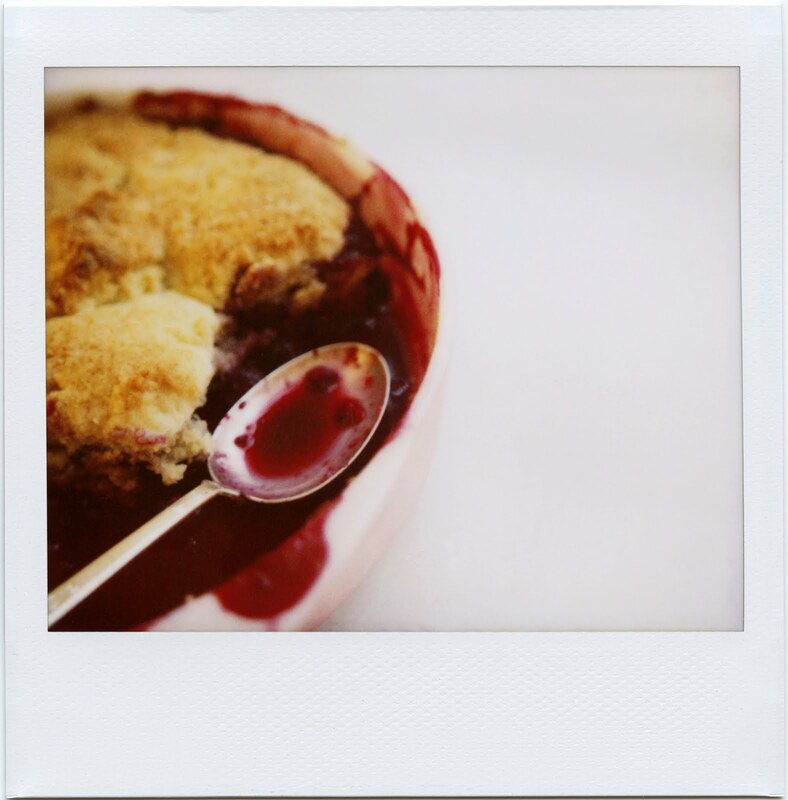 I often make cobblers as it is a great way to use up berries from the garden. I also love the smell of cooked berries, raspberries in particular, such a comforting aroma. I usually sprinke demerara sugar on the top which gives it a bit of a crunch & then serve hot straight from the oven with homemade custard or vanilla ice cream – yum!!! Hi Molly! I definitely grew up as a crisp girl, and the only cobblers I ever ate were a gerry-rigged with yellow cake mix and 7-up in a dutch oven. (not saying it didn't taste awesome) I need to give cobbler a chance. Looks lovely. You are so right… sometimes you don't want a recipe to stand up and do tricks – just be a really great, simple cobbler! I do think I like your berry combination better so will try it with that. I think I've been a crisp person, not because I have anything against cobblers, just because I didn't really know about them. Thanks for sharing, I will have to give cobbler a try. Sounds wonderful! Wish I had this recipe about a week ago after my husband and son came home with buckets of blackberries from Discovery Park! i LOVE your blog, and your column in Bon Appetit- it's the first thing i flip to when the magazine arrives at my home. i'm a crisp person as well, but am going to have to make this cobbler and see if i can't be swayed. 8 c. oatmeal, 3/4 c. packed brown sugar, 1 1/2 c. wheat germ, 1 c. flaked coconut (I use the unsweetened kind, like Bob's Red Mill), 1 1/2 c. mixed nuts (I used 50/50 almonds and cashews), 1/2 c. veg oil, 1/2 c. honey, 2 tsp. vanilla. Combine the last three ingredients and heat until bubbly. Pour over combined dry ingredients and mix. Bake on two greased cookie sheets, uncovered, in 325 degree oven for 15-20 min., until coconut is lightly browned. Stir twice while baking, and while cooling. Store in an airtight container and enjoy! 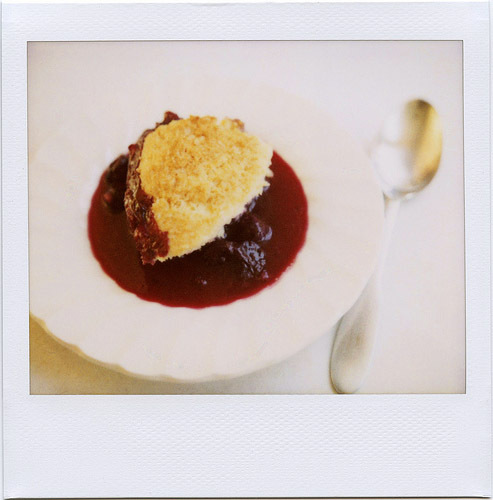 What does it mean if you don't care whether it's cobbler, crisp or crumble…cake or pie? Guess it means I need to go for a run. Would you stop shaking the foundations of my safe little world. I've been happy (so happy) to be a crisp girl til now – strawberry/rhubarb if you please. I think I'm a cobbler, crisp, and crumble person. cheers to all 3. Dr. Who. Golf. Julia Child. 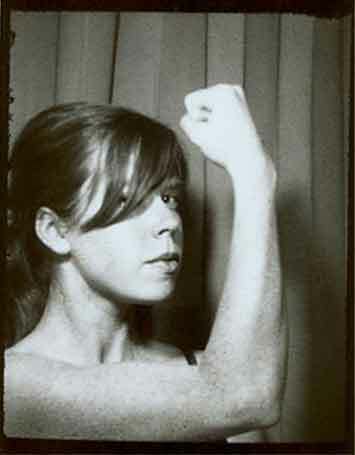 What a woman. I'm a little dubious she could squeeze in unlimited backscratching, and not be an official saint of sorts. both links were very interesting. as i'm not familiar with this type of sweets very much, i'm kinda amazed to know how much potentiality the same ingredients can have! btw, lovely pictures as always! love how deep the berries' red is. I'm generally a crisp type person but that looks wonderful. ummmmm i love love love love love Chez Panisse Desserts to death! I love how they are grouped, by herby things to berry things to things with wines in them- all by the character of the thing, not just by it's format (pie, cake, etc). ANDDD I, too, love the Wayne Thiebaud cover! I have long coveted his delicious desserty art…much as I covet the copy of Chez Panisse Desserts I had checked out from the library, and regretfully returned last week. Anyway, great post as always. It's cobblertime, forthwith! Cobbler or crisp? Cake or pie? Yes, please, I love them all! That being said, the only one of the bunch that I've never made is a cobbler and I think you've just inspired me to do so! I'm definitely a crisp person – I've actually never made cobbler. I've eaten it several times (always peach, it seems), and it just doesn't seem to have the textural zip of crisps. That berry juice does look delicious, though – I love blueberries and raspberries together. Oh, I totally want a ticket. If only we lived closer to Seattle! The cobbler looks delicious. Love this cobbler. I've used up my berries for the year (sniff) but on the bright side, it will soon be time to pick some apples! Yum. molly, what do you think of making this with cherries? i've got a big bag of sweet cherries at home right now that are asking to be made into something lovely, and i think this might be the thing. p.s. your photos in this post are breathtaking. Do you often have these “family dinners”? I would love to attend but I won't be in Seattle on the 31st. Hopefully you will do more of these events. But if you think about it, cobblers are pretty brilliant. They're upside-down pies, and the “crust” never gets soggy from the filling! knowing my grandmother (and Lady Julia's) opinions on butter and cream, i can say with confidence that she would love this cobbler. I am more of a crisp person, as well. I loved your recipe; simple and delicious. Although I substituted agave for the sugar, and added a bit of cornstarch to make up for the fact I was using a liquid sweetener. I meant, you didn't have to pick berries from the mean ladie's fence? If you have leftover cobbler–I know, unlikely–you can have it for breakfast with yogurt. Ours was made by my mother for a dinner party and it was blueberry-peach. Yum! It started my day off with a smile. I loved the part about the grandmother's cookbook. I have several items that belonged to my friends' mothers and I have them on a book shelf with my mom's picture. Some of these mothers I never met, but I feel like I am honoring them for raising the great daughters that became my friends. Thank you for reminding me that I need to look at my Chez Panisse desserts cookbook agaiin! Just reading this makes me hungry. 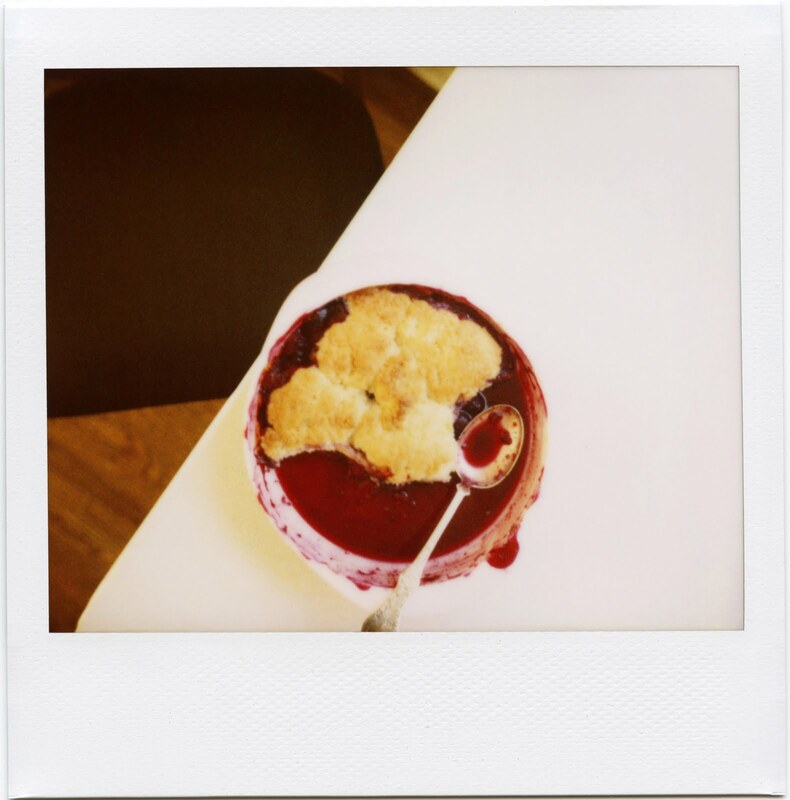 My grandmother used to make amazing cobblers in the summertime when when we would visit. The kids would pick big buckets of berries and then she would magically transform them into this scrumptious treat. I can still smell that aroma wafting through the big rambling house. I know what I am making today. love cobbler! and cobbler loves me! oh no. i just made your scones, then i saw this post. 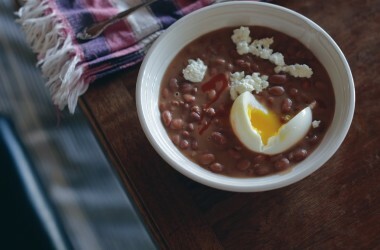 now i have to make this tonight. I have all these fresh berries just waiting to be consumed in some manner or other. It's hard to believe, but I only recently found your blog. Selfishly, it was because I started my own “food themed” blog. I post cooking webisodes every Friday and was wondering if you would mind if I make one from one of the recipes you have shared over the years? Maybe even this delicious looking cobbler! I have always been a crisp person. But this cobbler looks lovely. I will hav eto give cobbler another try! Ha, I also thought I was a crisp, not a cobbler, person until I stopped recently at the 19-Mile House on my drive back to I-5 from Mt. St. Helens. Their cobbler is divine in a homespun way, with a slightly crispy crust. (I think the seasonal huckleberry ice cream helped, too.) 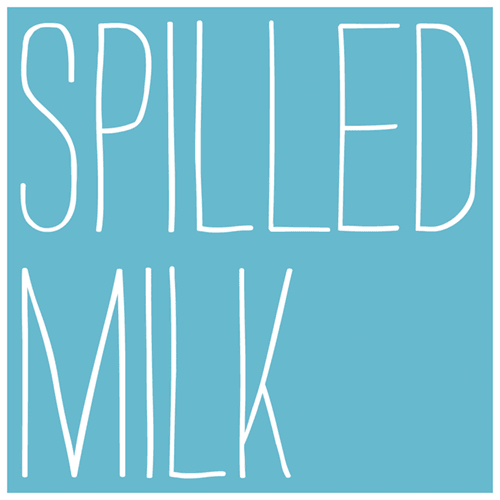 I try not to plug my blog on others, but I just blogged about it at Pacific Northwest Seasons. This is on my weekends “to-do” list! Sounds dreamy! Oh, cobbler, cobbler, cobbler . . . Growing up in the South, cobbler is a staple for dessert, and I consider myself lucky to have eaten so much of it in my lifetime! When me and my brother and sister used to visit my grandmother in Memphis, TN, she'd make us peach cobbler and blackberry cobbler (among many, many other desserts). The best was the blackberry cobbler, because she'd let us grandkids pick the berries, so we felt like we contributed to the amazing and delicious dessert that resulted. So cobbler is not only one of my favorite desserts, but also reminds me of summers and family and so many other good and fun things from growing up. Finally we arrived @ Delancey all the way from Vashon Island! Pizza was delicious and the tomatoes and the olives and the wine and the company in your wonderful restaurant. Congrats on your one year anniversary! We will be back!!! Um. I'm a cobbler and a crumble person. What does that make me? Actually, my mom always used to make my family an apple cobbler and it was really good too. Next week I will make this berry cobbler with her for our cousins. oh, and do you recommend using other fruits for a cobbler except berries, and apples? btw, your blog is really cool!! This post has been on the right day! It it not quite quite september yet, but it feels like winter already! rain , rain , rain….. I will make something very similary tonight with pears and raspberries and a crumble topping with ginger. It is in an American cookbook but it is called a pandowdy. I guess it is pretty much well a cobbler. If I could only have one dessert cookbook, this would be it. My copy is well-used, a bit splattered and very loved. A fave is the apricot and cherry tart on page 156. I make it annually when both fruits are in season. My copy is also Wayne Thiebaud one and, after reading your post – I've just discovered that it is also a first edition making it even more beloved. Dear god I love berries, your recipe looks so tantalizing that I would likely mane a nearby table of a people at a restaurant for just a taste. That berry cobbler looks divine!! I made the cobbler last night with 16 oz. bag of frozen mixed berries from Trader Joe's that I had in the freezer and baked it in a 10-inch glass pie dish. It was delicious – just sweet enough to bring out the berry flovors. The dough transformed into flaky and tender biscuits. As you said, it was still delicious the next day for breakfast. I like the name. The first time I've heard it. The story weaving Hannah into it makes for a wonderful read. Could imagine the upturned bucket in the kitchen. More power to the granny in the scheme of growing up. Looks D'Lish! I love crisp too and usually find cobbler disappointing. That is until my Uncle David's cobbler – pour boiling water over sugar sprinkled dough just before baking. Sooooo tasty! Oh but your cobbler looks good enough to be tried! And by the way. I do believe you don't have to be an either or person . . .for I am an “and” person! Pie and cake please! I'm probably more of a crisp person, but I do love crisps too. Fruit desserts are the best! I don't think I've ever had cobbler. Now I'm inspired to make one… Also, I wish I lived near you so I could eat at Delancey – family style sounds so fun! I am a cobbler person, and I love everything about this post. I'll have to try this recipe. Thanks, Molly! Reading your blog is like therapy, Molly. I can't wait for you to write another book! Molly – this was so delicious! Yesterday afternoon I drove around Seattle and picked blackberries and used them to make the cobbler last night. Such fun. Thanks for another berry recipe. We still have 3 more gallon bags of blackberries filling our freezer (already eaten almost as many) and never tire of new ways to have them for dessert. Can't wait to bake this! Ah, the dichotomies of taste. Yep, I'm a crisp man, with a pie-trumps-cake back-up plan. This recipe may just change my outlook. Thank you. I am a crumble girl myself. I did a rhubarb, pear and ginger crumble recently and gosh it was tasty! I have always been one of the pie persuasion, and rarely make cakes. It occurs to me now that I have never tasted the wonder that is cobbler. Ever. I too have a marvelously tempting bounty of ripe berries in my kitchen. Thanks to you, I have found myself lured tempted, and inspired to give it a whirl. Soon. I love grandmothers! Everyone has at least one cooking-with-grandma-in-the-kitchen memory. I must admit, I am a crisp person. However this simple recipe…I must try. Thanks! just made this (mix of red & golden raspberries + blackberries) for my husband, sister, brother in law, and mother. mom said they were the best biscuits ever, and i concur. fabulous! and there's one serving left for breakfast. Lovely story and wonderful recipe! I went to Chez Panisse for the first time a few weeks ago, after living in the Bay Area for 10 years. Happily, it proved that it's amazing reputation is well deserved. this looks delicious! here in NY though the berries and peaches arrived early and ended early, I'm so sad that berry season is over already! the good thing though is that apples are coming up soon! any fresh suggestions for updating apple cobbler? I just got your book A Homemade Life and have almost completely devoured it in two days. That's quite a triumph considering I homeschool and am smack in the middle of promoting a new business. I had to come check out you blog!! It's lovely and as a bonus I see you own a restaurant. We are already making plans to visit from Oregon. Wishing you much continued success. It was such a pleasure to get to meet you at the IFBC this past weekend, and because of that introduction, I finally raise the courage to reply to one of your elegant and poetic posts. I'd already posted this new memory over at Epicurious, before seeing that you'd posted on cobbler, too, here. In the spirit that blogging is about sharing, I add my thoughts here, too. Somehow I'd gone my whole life without making a cobbler, the last ten years of it living next to a blackberry bramble. Last week my son and I took matters in hand and filled the autumnal printed bowl (that usually only comes out for Halloween candy handouts) with juicy blackberries, so sun-ripened that they fell off like little soft puffballs of sweetness at the touch of his purple fingers. Those berries that made it the twenty feet to my kitchen ended up bubbling under biscuit dough sprinkled with pearl sugar. Eaten with vanilla ice cream that night, that cobbler has become a family memory. We won't be waiting another ten years for the next one. i think i'm a crips kinda girl. made blackberry and peachh ones yesterday. the country dinner at delancey was delicious and so much fun! the lamb was my favorite part. I'm definitely a crisp and pie person! But this recipe sounds so inviting — all of yours do, in fact, because of the lovely tales you weave around them. 🙂 XO and miss you!! Delicious! love the crisp..and your blog, I just discovered, is wonderful!!! Love Chez Panisse…I hope you visited the Ferry Building market place herein SF when you were down here..spent the day adoring local foods there yesterday..fabulous! Just came across your blog and I'm loving it. I made a berry cobbler a few days ago, we had a little get together and I decided to make the dessert myself. I'm glad I did. I used blueberries, raspberries, blackberries and rhubarb, and it was SO delicious that, in order to keep some leftovers for ME the following day, I took it away from the table. Selfish. I laughed (and almost cried) when I read that you ate it right from the pan, because that's what I did first thing Sunday morning. There's no rule that says you can't bake and crumble some streusel and then stir it into your fruit filling to make a cobbler/crisp. Or crisp-cobbler. You could also just sprinkle it on top of the batter. Or, if you put the batter on the bottom and the fruit on the top followed by some streusel, the batter will bake up around the fruit while the streusel gets all crisp and wonderful. Molly, you took the words right out of my mouth! I was all set to write about how I like crisps and crumbles better and how that might be disappointing to my relatives in Oklahoma. I went ahead and wrote my peach cobbler post anyway. I hope you like it! Oh yum! I love anything that combines fruit with crusty goodness! strangely, I've never made cobler before… apple cobler, berry cobler, plum cobler… I should really try! Had to try this recipe after I read your post. My son is a big cobbler fan. Turned very very good but I have to admit I think Dorie Greenspan's recipe is slightly better. Give it a try! “Le Cobbler” jus got out of the oven, along with two huge cookies I made since I had too much dough. It looks and smells amazing. Love your blog by the way, my boyfriend is addicted to your bread salad with cherries, arugula and goat cheese (from your book). Cheers, Marie-Claude. Sunday, September 5th, 2010. Just catching up from my holidays and read this deli recipe. I'm planning to make it by the 16th of September due to the visit of my boyfriend, here in Berlin. I'll tell you, of course, how did it went. Can't wait to make it…! While I'm wiping the tears away…I love this story about your friend Hannah! These are the brand of memories that I want my daughter to have of growing up. Life gets moving too fast ~ for what reward! Thanks for your lesson of the day. We will be having your cobbler this week on our slower path. What a great story, and fabulous-looking cobbler! Seems like a great end-of-summer treat! Thanks for the recipe! Made it for our Labor Day BBQ and our friends loved it. So simple and yet so satisfying. Also, I continue to make your banana bread recipe from your book and can't get over how delicious it is. The only bad part is that I keep eating the whole loaf myself (not in one day, mind you) which does not do much for my post-pregnancy diet plan. I'm definitely a cobbler person. Love the pictures! Molly/Lady Orangette….I just found out about you last month when I tried your spaghetti sauce and meatballs in Bon Appetite. I've made the recipe 3 times now….with the third time baking the meatballs separately….I can't get over how easy and delicious that recipe has been to use with my home grown and canned tomatoes….when I've told friends that there are no herbs or garlic in the sauce…they are confused….doesn't stop them from enjoying and eating it though ( chuckle). After reading a few entries on your blog…I had to get your book….I LOVE IT…You are my intro lady to the cooking blogs. Thanks for that gift…BUT thank you for a beautiful book. It's going to take me awhile to get through cooking things you've shared. I LOVE the family anecdotal approach….I'm a teacher…of 4th Graders…I'm thinking of having them write a narrative about a favorite dish they love to eat from their family…and then assemble it into a class book. ( Did you think you would inspire writing too ?!!!) Thanks again. Sincerely, Desert Dweller in Phoenix. you are the only person whose baking recipes i can actually trust and don't need to do a dress rehearsal before i make. any chance you have a trusted red velvet cake recipe you can point me towards? am making one for my mother-in-law for this weekend and don't know where to turn! Sadie, I wish I could help you! But the only red velvet cake I've made didn't turn out particularly well. (It called for using the juice from a can of beets instead of red food coloring, and the cake wound up sort of muddy-looking, with a slightly weird flavor.) If I were you, I'd look to see if the people at Cook's Illustrated have a red velvet recipe. (If you aren't a member of their site, you can sign up for a free trial.) You might also see what The Joy of Cooking has in the way of red velvet cake. Those would be my go-tos!